Although North Carolina utilities are required to supply a portion of their renewable energy from swine waste-derived power under the NC Renewable Energy and Energy Efficiency Portfolio Standard (REPS), few projects have been put in place. In an effort to accelerate deployment of swine waste-to-energy projects, Duke University commissioned this study to evaluate options for meeting the swine WTE set-aside. The analysis determined that the swine WTE portion of the REPS could be met with as few as 127 farms located in Sampson and Duplin Counties, assuming the use of highly efficient mixed anaerobic digesters to produce biogas (the fuel generated from swine waste) at each farm. The REPS swine-based requirements and estimates of power needed from the swine sector are shown below. 4. Transport of biogas from individual farms to a centralized location for purification, pressurization and injection into the existing natural gas pipeline (and assumed combustion in a highly efficient combined cycle natural gas plant). Based on a levelized cost of electricity (LCOE) for each scenario, on-farm electricity production and centralized directed biogas appear to be the most cost-effective approaches for satisfying the REPS. 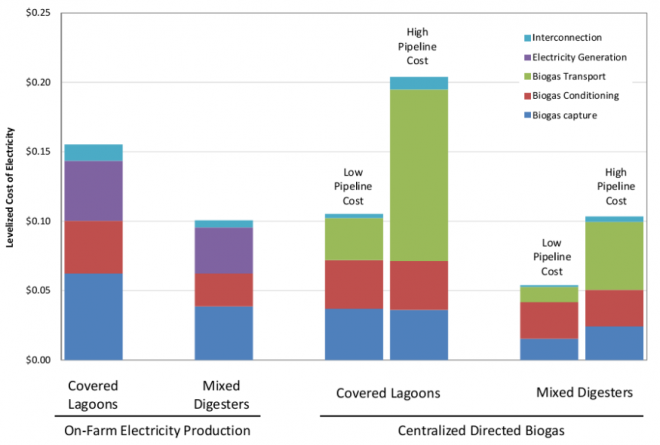 The range of costs identified for the on-farm and centralized directed biogas approaches are shown below. The LCOE for on-farm electricity production was estimated to be approximately 11 cents per kilowatt-hour (kWh), while the LCOE for a centralized directed biogas approach was equal to or nearly half of individual farm production, at between approximately 6 and 11 cents per kWh, based on estimates received for biogas and natural gas infrastructure and processing. Costs evaluated were limited to basic costs of production and did not include project development fees or potential payments to swine producers. Therefore, the LCOE should not be interpreted as the retail price of swine waste-derived electricity. Finally, the analysis evaluated the potential to generate greenhouse gas emission reductions (“carbon offsets”) as well as meet the state’s environmental performance standards, which would significantly improve waste management at the farms and allow for farm expansion. Regarding carbon offsets, because these projects would destroy biogas which contains large amounts of methane—a potent greenhouse gas—they are eligible to sell carbon credits to the California carbon market—the largest carbon market in North America. The analysis found that these projects could supply a total of approximately 1.3 million carbon credits annually, which have recently been trading at a price of roughly $10 per credit. Regarding costs to meet the environmental performance standards, including innovative waste management system components at each farm were projected to add approximately 2 – 3 cents to the cost per kWh. → Develop construction-level cost estimates for the centralized directed biogas approach to narrow the range of pipeline construction costs. → Expand the financial model to include payments to farm owners, development fees, profits, and incentives and tax credits. → Evaluate price for swine-based RECs that would encourage the development of the swine biogas resource. → Monetize benefits associated with installation of innovative swine waste systems that use digesters. The OPTIMA Directed Biogas Study was made possible through the generous support of Duke Energy Carolinas and Environmental Defense Fund.